A very attractive Art Deco combination fire. 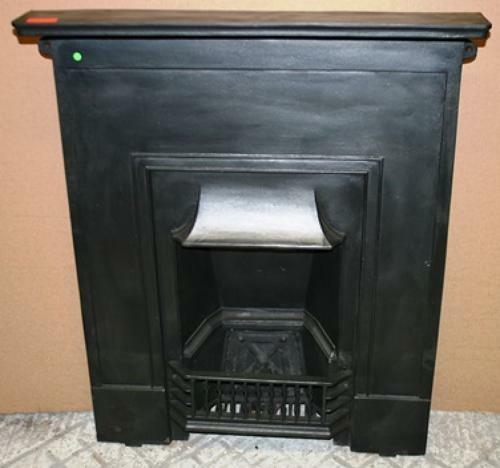 The fire has a fantastic, classic, Art Deco design with beautifully styled smoke hood and decorative front bars. The fire has a pretty cross design to the concrete fire back, which is a a rare feature within a fire. The fire is a reclaimed antique and therefore does have some signs of use and wear. The iron has been blacked and polished and has an attractive finish and colour, however there are some slight casting marks and scratches. There has been a repair made to a crack in the mantel and it is now solid. One bolt is missing from the mantel and it has been replaced with a large, solid, nail. The mantel is sturdy but please note the nail head does not fit flush with the mantel. Buyer may wish to replace nail with a mantel bolt. There are some slight chips to the mantel edge. The fire has a wonderful, classic, look that would suit most interiors and add style and interest to a home. A lovely antique item.